How should you learn to fly fish? Since we sell fly fishing videos our answer is get some great basic fly fishing and fly casting videos and study them, then head outside and practice. Finding a friend or professional fly fishing instructor to give you lessons is your next step, but getting some of the terminology and techniques down beforehand can make your personal instruction time that much more valuable. Our fly fishing basics series includes a solid collection of finely detailed videos on the fundamental elements of fly fishing. Free of both egos and endorsements, they graphically demonstrate the essential techniques and tactics the new fly fisher needs to master if they are to become proficient in the sport. Hosted by fly fishing's most outstanding professionals; they deliver essential lessons in terms even the uninitiated can comprehend. 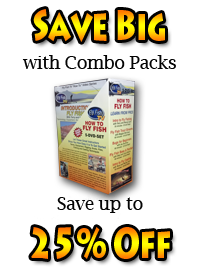 The instructors and the practical lessons they give make these videos proven winners if you want to learn how to fly fish. Our experience has been that having your spouse getting you started fly fishing can be the wrong way to go in some cases, regardless find a mentor you will be comfortable learning from. Fly shops and fly departments at your bigger sport stores can often be a starting point. We have taken great care in selecting the hosts of our basic fly fishing videos and know you won’t be wasting time if you give them a try. The first thing everyone seems to want to know when it comes to learning the sport is how to fly cast. Fly fishing is what it says it is, fishing, and this should be your initial focus if you don’t want to get frustrated once you get to the water. The pretty arc of the line as it soars through the air is eye catching but very few fish are actually caught in the air. Learning how to assemble your fly line, leader, weight, flies, and basic angling skills should come before learning all the ins and outs of casting. You will eventually discover the fly casts that catch the most fish are not the big pretty ones but instead the smaller and more precise kind. In one of our basic fly fishing videos “Fly Fishing Trout Streams”, Maggie Merriman demonstrates several short casts you need to learn to get your fly in front of the fish. In the entire production you’ll discover there is very little waving the line in the air like you see in the TV commercials rather a lot of short stokes of the rod that direct your line and fly to where it needs to be. To learn about all the fly fishing gear there is would take forever because too many folks have too much time on their hands and spend a lot of it coming up with new stuff. It doesn’t have to be complicated, in fact the basic fly fishing equipment you need is about as simple as you get when it comes to any kind of fishing. However, as you will discover if you are going to start fly fishing is that the naming of this simple stuff has been made somewhat complicated. In our How To fly fish DVD “Introduction to Fly Fishing”, Terry and Wendy Gunn explain the fly fishing terminology that has been unduly complicated. Fly fishing rods and lines are the most important tools of the game. They come in sizes, or weights, from #1’s to as large as #15’s; with #1’s being used for tiny fish and #15’s for monsters. #5 to #7 weight rods are the most common for much of our trout and warm water fly fishing. You match the appropriate weight rod and line together and add a reel. The fly reels don’t come in quite as many sizes as the rods so a single reel can work for a number of different sized rods and lines. Fly rods are made many different ways but most of it comes down to the action of the rod. In gross terms you have slow, medium, and fast action rods. In loose terms slow rods flex more and fast rods flex less. If you are fishing small trout or pan fish, for example, you might use a slower action rod to enhance the fight. Conversely if you were fishing steelhead or musky you might want a faster action rod to cast a heavier line and fly. A medium action rod is a good place to start. It is important that you actually try out any rod before you buy. Your fly line serves as your casting weight in this form of fishing. Instead of throwing a heavy lure or sinker attached to bait, it’s the fly line that gets your presentation to the fish. You use the weight of the line and momentum you create with your casting stroke to propel your fly. You have essentially three kinds of fly lines; a floating line for fishing on the surface or for suspending flies below it, an intermediate line for fishing below the surface down to ten feet at the most, and sinking lines for fishing deeper water. A dry line is the most versatile and what you want to start fly fishing with. Off your fly line you attach a leader that is a generally a 6 to 12 foot of tapered monofilament or fluorocarbon line. It is less visible than your fly line and after your cast is your next step in fooling the fish. Your leader is designed to unfurl at the end of the line when you cast and gently set your fly on the water. This leader is heavier weight and diameter at the top where it connects to your fly line and lighter weight and diameter where you put the fly. At the end of the leader you attach a short, 1 to 2 feet, piece of monofilament called tippet. It can be replaced easily as you use it taking on and off flies, and as a consequence you won’t need to replace your more expensive tapered leader as often. In their basic fly fishing video Terry and Wendy Gunn clearly demonstrate how to assemble your line and leader and how to tie the few simple knots needed to assemble it. It is worth noting that leader and tippet strengths or weights are in inverse order to the numbering system for rods and lines. An X designates the strength, and 7X would be about the lightest you would ever use while 1X is extremely heavy. At the end of your basic fly fishing system goes the namesake of the whole game, the fly. Simplistically there are three types of flies to choose from. Dry flies are those that float naturally on the surface and imitate insects or other aquatic critters a fish might feed upon. . Nymphs are fished under water and generally resemble insects or creatures that reside on or near the bottom and are drifting in the current. Streamers are the third form and most often resemble minnows or larger aquatic critters that are swimming along or fleeing. Deciding what fly to use is one of the most fun parts of fly fishing and most confusing. Dry flies are easiest to use since it is obvious when a fish comes up to the surface to take them. Nymphs however make up 90% of a trout’s diet and consequently are more productive for this type of fishing on a day to day basis. Streamer flies are a bigger meal for a fish and often produce fewer but larger ones. In general it is good to get some local knowledge of what flies to use in any particular place. You can be sure the local shop or store will be selling the ones that are the best producers. A key element of learning what flies to fish is knowing where the fly patterns actually came from. Jay Buchner, our host of “Bugs for Beginners”, does a great job showing you many of the insects and aquatic critters that trout feed on, and explaining the terminology used to describe them. Getting your fly gracefully to the water and allowing it to freely move on or in the water are the keys to being an effective fly angler. This is called presentation and mastering it means learning how to make you fly appear as natural as possible to the fish. It is often said fish are not very smart but it is true they have great instincts. This means they can tell in an instant if your fly looks like and is moving like the real thing. This is your greatest challenge as a budding fly angler, you can have all the right stuff and casting skills, but if that fly doesn’t look like the real thing and isn’t put where the fish are dwelling you aren’t going to be effective. Each species of fish you might fly fish for have different habits and habitats so you need to know a bit about them if you are going to make the right presentation. In general, rivers demand that you know how to “Get the Drift”. This means learning where to make your cast and how to manage your fly line once it is on the water so that your fly is moving at the same speed as the current. On stillwaters the mantra is more often “Get the Depth” and this means understanding where in the water column the fish are so you know how deep you need to get your presentation. This is where Fly Fish TV and your fly fishing mentor come into play. You need to watch someone fly fish and get out and practice fly fishing to become proficient. Our “Introduction to Fly Fishing” and “Introduction to Fly Casting” videos can give you a great foundation. After you have these basic skills you can move onto information on particular species. “Fly Fishing Trout Streams” will teach you how to fish trout in rivers, “Fly Fishing Bass & Panfish will show you how to catch warm water species in lakes and reservoirs. “Smallmouth Fly Tactics” will help you master fishing bass in moving water. Kelly Galloups “Nymphing by the Numbers” is an excellent tool for learning how to fish below the surface. If fly fishing intrigues you get started right now. The sooner you begin the sooner you will discover a great way to immerse yourself in the outdoors. Fly fishing is not as difficult to learn as you might imagine and in a lot of beautiful places it is the best way to catch fish.